Replacing a bathtub can take days or even weeks and really mess up your life and your pocket. A tub replacement could bring in a demo crew, plumber, drywaller, carpenter and/or painter. These people are going to traipse in and out of your house, causing you stress and creating a mess. Professional bathtub refinishing is a cost effective alternative to replacing a bathtub that is worn out, rusted, cracked, damaged, or out of style with a dated color. 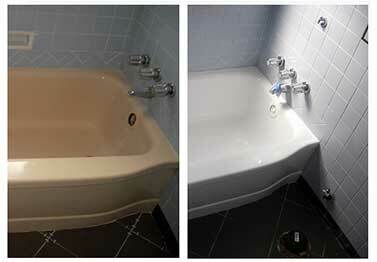 Contact Jemco Reglazers to learn about our bathtub restoration services! Bathtub repair can be successfully performed on all types of bathtub materials. For example porcelain bathtub repair can look as good as tubs made of fiberglass, acrylic, or cultured marble. Bathtub repair can save the day! 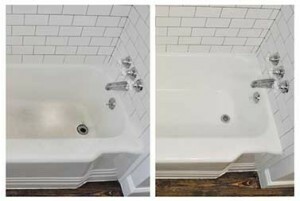 Our tub resurfacing service, sometimes called bathtub restoration or bathtub refinishing, is a low cost solution that usually takes just a few hours and you can use your tub the next day. Call Jemco Reglazers today, the North Jersey bathtub repair experts! First we check the surface for damages. Any damaged caulking is removed. We thoroughly clean the tub, sink, and/or tiles with an industrial acid etch. The acid etch brings the enamel to a faintly rough surface, comparable to a chalkboard. We fill any chips, deep scratches, etc with a professional fiberglass and sand to a smooth finish. We place masking paper around the tub and the overflow plate is removed. The rest of the floor is covered with a drop cloth and then we install a ventilation system. After all this is done, we are ready to begin the process of spraying. We spray 2 coats of base primer inside and outside of the bathtub and we let the primer dry for about 10 minutes. We spray 3 coats of poly-glass resin, and the finish will be shiny and glossy. The tub will look like new again. After the job is complete we highly recommend waiting 24 hours or until the surface is completely dry to start using your tub or sink. This will guarantee a life span of 10 to 15 years with good care. Call Jemco Reglazers today for a free, no obligation bathtub reglazing service quote!